SVERT reported that a weak thermal anomaly over Tiatia was detected in satellite images on 1 September. The Aviation Color Code remained at Yellow. No eruptive or thermal activity is known on Tiatia between 1988 and the beginning of 2010, but thermal anomalies began in February 2010. During its last activity, in 1988, Tiatia displayed steaming in many parts of the crater (SEAN 13:11). The volcano, whose alternate names include Tyatya and Chacha-dake, sits near the NE margin of Kunashir Island (figures 1-3). Figure 1. A map showing the location of Tiatia volcano very near the southern end of the Kurile island chain. For scale, NE-trending Kunashir Island is 123 km long. Tiatia and the city of Sapporo (on the NW side of Hokkaido Island, Japan) are ~ 600 km apart. Figure 2. Two aerial views of Tiatia disclose its striking morphology. 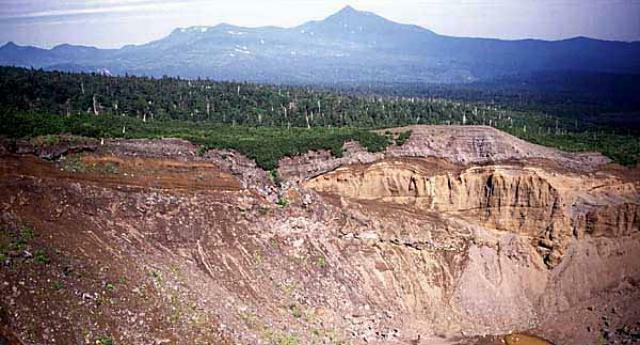 (left) View in 1973 showing the symmetrical caldera rim, which encircles an axially symmetrical inner cone with a broken top; scoria cones lie on the SE slope (mid- to foreground). (right) Viewed from the S in 2008 on a clear day. Courtesy of volcanologist Anatoly Khrenov (1973 photo) and blogger Udachnik (2008 photo). Figure 3. An ASTER image of Tiatia taken on 29 June 2006 shows considerable snow surrounding the crater and down the caldera's flanks. Where visible, the slopes generally appear densely vegetated, except for the crater, some upslope areas, and around minor cones on the lower right and upper center. N is towards the top; the summit caldera is ~ 2 km in diameter. Courtesy of Aster Volcano Archive. According to the Sakhalin Volcanic Eruption Response Team (SVERT), thermal anomalies were detected during 2010 by satellite on 9 February, 31 May, 10 June, 19 June, and 25 June. Tiatia lacks a local seismic instrument and satellites are the primary tool used for monitoring. The satellites used in detecting these anomalies was not identified. MODVOLC thermal alerts were absent, a circumstance that could be explained by their reasonably high threshold in order to minimize the mis-identification of thermal activity. Information Contacts: Sakhalin Volcanic Eruption Response Team (SVERT), Alexander Rybin, IMGG FEB RAS, Yuzhno-Sakhalinsk (URL: http://www.imgg.ru/); The ASTER Volcano Archive (AVA), NASA Jet Propulsion Lab, California Institute of Technology (URL: http://ava.jpl.nasa.gov/volcano.asp); Hawai'i Institute of Geophysics and Planetology (HIGP) Thermal Alerts System, School of Ocean and Earth Science and Technology (SOEST), Univ. of Hawai'i, 2525 Correa Road, Honolulu, HI 96822, USA (URL: http://modis.higp.hawaii.edu/); Udachnik (URL: http://dirty.ru/comments/245960). SVERT reported that a thermal anomaly from Tiatia volcano was detected by satellite on 25 June. SVERT reported that a thermal anomaly from Tiatia, a volcano on NE Kunashir Island, was detected by satellite on 19 June. 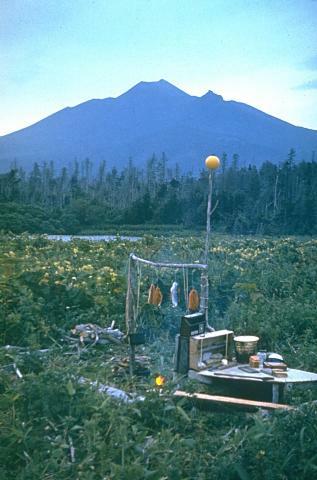 Tiatia does not have a seismic network; satellite image observations are the primary tool for monitoring many of the Kuril Islands volcanoes. SVERT reported that a thermal anomaly from Tiatia was detected by satellite on 10 June. Tiatia does not have a seismic network; satellite image observations are the primary tool for monitoring many of the Kurile Islands volcanoes. SVERT reported that a thermal anomaly from Tiatia was detected by satellite on 31 May. Tiatia does not have a seismic network; satellite image observations are the primary tool for monitoring many of the Kurile Islands volcanoes. SVERT reported that a weak thermal anomaly from Tiatia was detected by satellite on 9 February. The Tiatia volcano began erupting several months ago . . . . During the current activity a crater has formed at the foothills of the eastern slope and is ejecting ash at 1-second intervals. The eruption cloud reaches a height of 5 km above the summit, and flames can be observed at night. The explosions are audible up to a distance of 50 km from the volcano, and the depth of ash near the volcano measures up to 60 cm thick. After lying dormant since 1812, [Tiatia] erupted on 14 July. The volcano has been continually throwing out fire and ash every 1.5-2 minutes, and the color of the island changed from green to a dirty gray in the space of two days. This eruption . . . was preceded by a series of earthquakes of considerable magnitude. A very strong shock occurred on 17 June, and a second, stronger earthquake followed a week later. On the second day of the eruption it was observed that the eruption cloud reached a height of 5,000-6,000 m, and that the explosions were occurring every 40-60 seconds. Information Contacts: Card 1677 (16 July 1973)Y.M. Doubik, IV. Card 1684 (27 July 1973)Y.M. Doubik, IV. Further Reference. Markhinin, E.K., 1984, On the state of Kunashir Island volcanoes (March, 1974-May, 1982): Volcanology and Seismology, v. 5, no. 1, p. 45-52 (English translation); 1983, no. 1, p. 43-51 (in Russian). Residents of the E end of Hokkaido heard an explosion on 20 July at 1325. The explosion was not recorded by seismographs or microbarographs in E Hokkaido. Tiatia, approximately 50 km to the E, was obscured by fog. The next morning, the crew of the JMSA ship Kunasiri observed a white cloud rising 600 m from Tiatia, but heard no explosions. No ashfall was found (in Japan) on 20 or 21 July. The crew of a Japanese fishing boat cruising near Kunashir Island observed "smoke" rising from Tiatia on 10 June. During the night of 24 June, an orange glare was observed in the direction of the volcano from [JMA's Nemuro Weather Station], 120 km away. No additional activity has been reported. Information Contacts: Kyodo Radio, Tokyo. "Aerial inspection on 20 September of the volcanoes in the S and central Kuril Islands revealed that Tiatia's summit crater was in a state of moderate fumarolic activity. No individual distinct fumaroles were observed; vapor was being released from the whole crater surface. Numerous vapor sites were also noticed on the outer slopes near the summit crater. There were no remarkable changes near the volcano summit as compared to 1977-78. A certain increase in heat activity was observed near the subordinate vent (formed in 1973) on the S slope. Heat flow measurements made in the vent in 1981 by A. Zemtsov and A. Tron yielded values of q = 7.4 and W/m2 = 1.77 cal/cm2s, 1.2 times as large as in 1978. Orange glare was observed by people in Yuzhno-Kurilsk, 50 km SW of the volcano, but we are not sure that it was related to volcanic activity." Fumarolic activity in the summit crater remained at the same level. Steaming ground was observed in many parts of the crater, but well-formed fumaroles were not evident. The intensity of steam release increases when atmospheric pressure drops and after precipitation. Tiatia's last reported activity ejected a 1-1.5-km-high white steam column in February 1982. Chachadake, also known as Tiatia, consists of a beautifully symmetrical cone that rises above the broad rim of an erosionally furrowed, 2.1 x 2.4 km wide caldera. The edifice occupies the NE tip of Kunashir Island and morphologically resembles Mount Vesuvius. The pristine-looking conical central cone, mostly formed by basaltic to basaltic-andesite strombolian eruptions, rises 400 m above the floor of the caldera and contains a 400 x 250 m wide crater with two explosion vents separated by a linear septum. Fresh lava flows cover much of the SW caldera floor and have overflowed the rim, extending to the foot of the older somma, which formed during the late Pleistocene or early Holocene. A lava flow from a flank cone on the northern caldera rim reached the Sea of Okhotsk. A major explosive eruption in 1973 followed an initial historical eruption in 1812. There is no Deformation History data available for Chachadake [Tiatia]. There is no Emissions History data available for Chachadake [Tiatia]. Tiatia volcano rises above a campsite on northern Kunashir Island. A beautifully symmetrical cone (center) was constructed within a 2.1 x 2.4 km caldera. The 1819-m-high Tiatia, also known as Chacha, produced fresh lava flows that cover much of the SW caldera floor and have overflowed the rim, extending to the foot of the older caldera. A major explosive eruption in 1973 was the first since Tiatia's initial historical eruption in 1812. 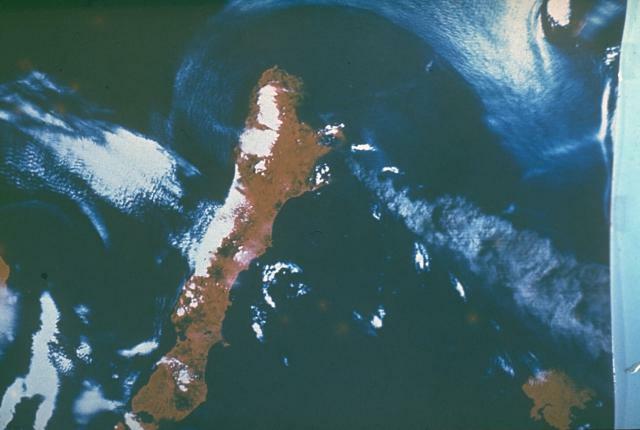 A false-color satellite image in July 1973 shows a dark-gray eruption plume blown by high-altitude winds to the SE from Tiatia volcano on the NE tip of Kunashir Island. The eruption, the first of the 20th century from Tiatia, began on July 14, with a plume that reached 5 km above the summit. The eruption originated from new vents on the NNW and SSE flanks of the central cone and was one of the largest historical eruptions in the Kuril Islands. Explosive activity lasted for 12 days and was followed by two days of lava effusion. Photo by National Aeronautical and Space Administration (NASA), 1973. A 400-m-wide crater truncates the summit of the central cone of Tiatia volcano, on the NE tip of Kunashir Island. 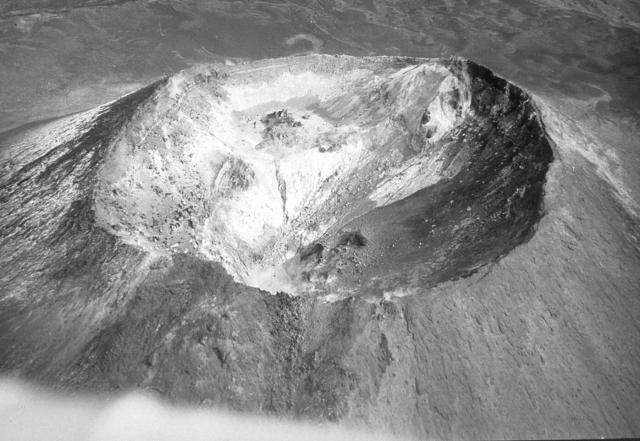 The SE part of the crater rim (upper right), seen here in October 1990, is considerably higher than the rest of the rim and forms the 1822-m-high summit of the volcano. The symmetrical summit cone rises 400-m above the floor of a caldera that truncates an earlier Pleistocene volcano. 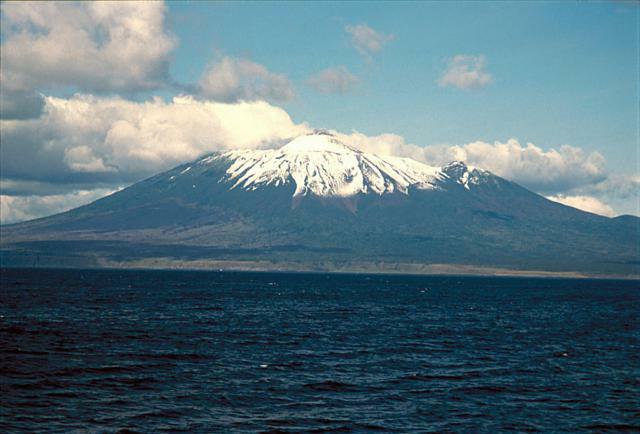 The SE flanks of 1819-m-high Tiatia volcano, one of the most impressive of the Kuril Islands, rise above the Pacific Ocean at the NE tip of Kunashir Island. A beautifully symmetrical cone (center) rises above the low snow-covered rim of an erosionally furrowed, 2.1 x 2.4 km caldera. A major explosive eruption in 1973 was the first since Tiatia's initial historical eruption in 1812. Copyrighted photo by Yoshihiro Ishizuka, 1992 (Japanese Quaternary Volcanoes database, RIODB, http://riodb02.ibase.aist.go.jp/strata/VOL_JP/EN/index.htm and Geol Surv Japan, AIST, http://www.gsj.jp/). The gently sloping volcanic massif on the left-center horizon, left of sharp-peaked Rurui volcano, is Smirnov volcano. These two volcanoes are located at the NW tip of Kunashir Island. Smirnov volcano has been extensively eroded by glaciers, but contains young pyroclastic flows and lava domes. The late-Pleistocene Rurui volcano has an active fumarole field on its western flank. The fresh crater in the foreground is the northern crater of the 1973 eruption of Tiatia volcano, SE of Smirnov and Rurui. Copyrighted photo by Yoshihiro Ishizuka, 1999 (Japanese Quaternary Volcanoes database, RIODB, http://riodb02.ibase.aist.go.jp/strata/VOL_JP/EN/index.htm and Geol Surv Japan, AIST, http://www.gsj.jp/). There are no samples for Chachadake [Tiatia] in the Smithsonian's NMNH Department of Mineral Sciences Rock and Ore collection. Large Eruptions of Chachadake [Tiatia] Information about large Quaternary eruptions (VEI >= 4) is cataloged in the Large Magnitude Explosive Volcanic Eruptions (LaMEVE) database of the Volcano Global Risk Identification and Analysis Project (VOGRIPA).